Taking a pregnancy test can be a confusing experience for expecting mothers-to-be and couples, especially if it is a first experience or the couple is not aware of how a home pregnancy test works. It can seem like the whole world hangs precariously on a strip of paper, and the color it shows immediately after following the instructions. While traditionally, receiving a confirmation of pregnancy required an appointment with a medical doctor or gynecologist and waiting for expert test results, some people opt to purchase a home pregnancy test kit, for private use in the comfort of their home. These do-it-yourself pregnancy kits not only simplify the process, and allowing women to have more control, but they also prevent spending time anxiously waiting for professional test results, or an upcoming appointment. Although it may be an intimidating experience for some, opting to purchase and use a home pregnancy kit comes with many advantages. Securing an appointment with a medical doctor or gynecologist at the ideal time is sometimes easier said than done, and can present some challenges. Some women do not have a family physician or want to receive a confirmed result as quickly as possible, without having to wait for a referral. Securing an appointment with a doctor at the right time can be especially difficult if the preferred physician is one of the more popular, or only, gynecologists in a locality. In this case, an appointment may be difficult to secure in a timely fashion, if at all. Why Choose A Home Pregnancy Test? Purchasing a home pregnancy test kit seems to be easier, and a lot more practical than seeking out a doctor when a woman misses her menstrual cycle or is experiencing symptoms of early pregnancy. There are many do-it-yourself home pregnancy kits available on the market today that women can sometimes get baffled by the many choices that they have. It is not necessary to buy test kits from each company, though all manufacturers of these products vouch that theirs is the best on the market. Nonetheless, it is not feasible to purchase one of every test, and women need to decide on a purchase. Most test kits contain one little number that can make or break the final result. The only reason why people go for a doctor administered test over a home test is that the physician’s diagnosis is always the more accurate one. The best choice for women is to choose a kit which has a high accuracy range, ideally over 97%. The HCG detection level in the kit must meet with FDA standards. HCG, or Human Chorionic Gonadotropin, is a hormone produced right after conception. At early stages, low HCG levels are secreted, and a pregnancy test kit taken very early in pregnancy must be capable of detecting this hormone in the urine. Women should choose kits which have a detection level that exceeds 25 mlU /ml, consistent with the FDA standard. One of the biggest hassles with home pregnancy test kits is trying to understand the test results. Anybody taking a home pregnancy kits is anxious and excited while waiting for results to materialize, and it is disappointing not to be able to read the final result. Some pregnancy test windows are more easily understood than others, depending on individual understanding, so the way in which results are displayed is also an important consideration. Another thing to consider when choosing to purchase a home pregnancy kit is its value and price. Some home pregnancy test kits offer more than one test at a lesser cost than buying multiple tests, individually. Women who want a second result to be sure often choose to go with this option. Different brands have varying prices, and the price is also affected by the features that the home pregnancy test provides. Nothing beats the importance, however, of getting an accurate and reliable result, which can sometimes be sacrificed for a lower price. The Easy@Home HCG urine strips are among some of the best home pregnancy test kits available. 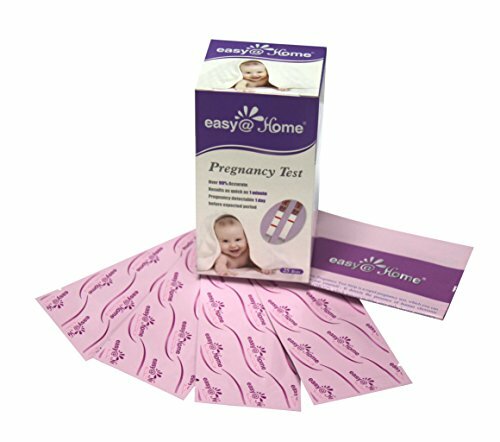 The Easy@Home test kit is easy to use and hassle free. This pregnancy kit tests a urine sample for hCG hormone levels. Users simply dip the test strip in a urine sample and wait a few minutes to see the results. 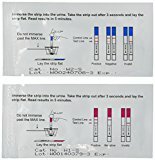 The Easy@Home urine strips are not only easy to use but easy to read as well. The product easy to understand positive and negative test indications. A single line indicates that the user is not pregnant, while two lines mean that they are. Combined with the high level of accuracy and excellent value for money with 25 strips per purchase, the kit satisfies all the requirements to be considered as one of the best home pregnancy test kits for purchase. The Easy@Home HCG strips have a high score when it comes to testing result accuracy. The fact, however, that a few reviews report these strips to give false positives or false negatives does not make the kit infallible. With more than 75% of users giving the product a 5-star review and vouching for its reliability, users can be sure that this is one of the best kits on the market. The FDA standard compliant detection level and the customer support initiative from the company are reassurances as well. The ClinicalGuard® hCG pregnancy test strips are an easy and worthy competitor when it comes to being considered as one of the best pregnancy test kits in the market. The kit is easy to use and is designed to be accurate and give fast results. It uses the same science that physician administered pregnancy tests do, so can be considered a reliable choice. ClinicalGuard® hCG Pregnancy Test Strips display a final result code as opposed to other test kits, which display results with either one or two lines. Pregnancy strips are divided into two zones – the control zone and the test zone. If a single color band appears in the test control window, and no color bands appear on the test control window, it indicates not pregnant. Distinct color bands appear in the control and test zone to indicate pregnancy. The ClinicalGuard® is undeniably a great pregnancy test kit. It is easy to use because it allows women to dip the test strips into a urine sample, rather than urinating directly on them. The manufacturer also provides excellent customer support regarding product usage and test result decoding. This product holds a solid five-star rating with more than 70% of customers. The only reported complaint regarding this test kit had to do with suspected lower rates of accuracy and a lesser amount of strips included in the package. The Wondfo Pregnancy Test Strips are one of the most commonly used home pregnancy test kits on the market. These are simple to use dip strips that have a width of 3.5 mm and are easy to handle. All users need to do is dip the pregnancy test strip into a sample of urine and check for a result within three to five minutes. The Wondfo test strips have a clear indication when it comes to results. The strip is divided into the test zone and control zone. A color band in the control zone only indicates a negative result, while distinct bands in the control zone and test zone suggest that the result is positive. The Wondfo pregnancy test strips are made of specific materials that react with the hCG hormone secreted, along with the urine post implantation. Since the strips are extremely sensitive to this particular hormone, the intensity of the color bands can vary, depending on how far into the pregnancy the user is. Wondfo pregnancy tests, even with their share of cons, are also some of the best pregnancy test kits on the market. The easy to use dip strips offer a hassle free experience, and decoding results of these tests have been reported to be extremely simple. The product has a five-star rating, with more than 60% of real customers. 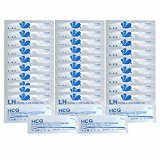 Most users, however, suggest that the strips do not provide accurate indications of hCG hormone levels during the various stages of pregnancy, despite being a product which claims to have a high level of sensitivity. The Wondfo strips are available in packages of 25 dip strips per purchase. AccuMed Pregnancy test strips are manufactured by AccuMed Biomedical and are compliant with the highest standards of quality in the manufacturing process. The test strips are compliant with FDA standards, feature AccuMed support, and come with a full warranty in the United States. The AccuMed home pregnancy test kits are dip strips. To test for pregnancy, users simply dip the test strips into a urine sample for a duration of three seconds. The results will be readily available and can be clearly read in less than 5 minutes. After the five minute window, however, the urine sample on the strip begins to dry off, and this can lead to false results when read. The results are easy to decode on these pregnancy tests. The AccuMed test strips make use of two zones – the control zone, and the test zone. Instead of featuring color bands in these zones, the results are indicated with simple lines. A single line, or active control, indicates a negative result, while dual lines (an active control line and test line) indicate a positive result. Precise results – One line indicates negative results while two lines indicate positive results. The AccuMed pregnancy test strips offer accurate results and are manufactured by a trusted brand. There have been cases, however, in which conflicting results from the same batch have been discovered. The product has a 5-star rating with over 60% of real customers. It offers 25 separately packaged dip strips per purchase. The Easy@Home Combo Kit is designed for women who are trying to conceive. The Combo kit consists of ovulation strips (LH strips) that help users keep track of menstrual cycles as well as determine the period of optimum fertility. It also consists of pregnancy test strips (hCG strips), eliminating the need to purchase two products. The testing is done using dip strips. Users can simply dip the desired strip in a urine sample for three to five seconds. Positive or negative results depend on the number of lines that appear on the strip. One of the biggest advantages of purchasing a Combo Kit is the fact that they contain fifty ovulation strips as well as twenty pregnancy test strips. Combo kits are an option that not only helps in accurately tracking menstrual cycles, but also determining when a woman has become pregnant. The Easy@Home Combo Kit is undeniably one of the best solutions for women who are trying to conceive a child. This comprehensive kit contains ovulation strips as well as pregnancy test strips. These not only help in accurately determining pregnancy results but also help women to keep track of their menstrual cycle, and periods of high fertility. The product has a five-star rating with over 70% of real customers, which proves that it is one of the best full pregnancy test kits available on the market. Though Home Pregnancy test kits are easy and convenient when it comes to finding out quick results, women should never consider them to be more accurate than a doctor’s diagnosis. Home pregnancy tests can indeed be used as a first step towards testing for pregnancy, but women should not rely on the results of a single test. The best way to go about testing for pregnancy is to use three or four different samples of urine, collected six to ten hours apart. If the results remain consistently positive or negative, women can be satisfied with their conclusions. Users who encounter conflicting results, or want to be 100% sure, should consult a professional medical doctor. Home pregnancy tests have a great many numbers of advantages. Women love the convenience and accuracy that taking a home pregnancy test provides. They also love the peace of mind that they provide, while waiting for an appointment with a family medical doctor or gynecologist. Home pregnancy testing kits can be purchased relatively inexpensively, online, or in grocery and drug stores nationwide.